should be affordable to everyone. Today, that vision is as clear as ever. Because, while other automakers say no to leasing and no to financing, we are committed to helping you get behind the wheel of a brand-new car, truck, SUV or crossover. With Ford Credit, we offer outstanding personalized terms and options. For more information, go to fordvehicles.com. Ford is also committed to help make driving more affordable for everyone, with the all-new 2010 41-city mpg Ford Fusion Hybrid, the most fuel-efficient midsize sedan in America. It gets eight more miles per gallon in the city than Toyota Camry Hybrid. With the Built Ford Tough F-150, which delivers unsurpassed fuel economy in its class – 21 hwy mpg.2 And with Escape Hybrid,the most fuel-efficient SUV on the planet. We’re proud that Ford offers 15 car, truck and SUV choices that get 25 mpg or better. And, new from Ford, the EcoBoost™ V6 engine.5 It is twin turbocharged with direct injection, so it delivers the power of a V8 with the efficiency of a V6, along with reduced emissions. Stay tuned for more innovations from the company that put America on wheels in the first place. We invite you to drive with us into a brighter future. With all the focus upon efficiency and safety these days, some might think the new Ford Mustang (a sports car known to all) might not have the best track record when it comes to safety and passenger protection. Think again. The stiffened platform and multiple updates to the 2010 Ford Mustang make for a package of power as well as safety. Yeah, yeah "safe"...somewhat subjective until a reputable metric is applied. How about a fiver-star rating from the National Highway Traffic Safety Association for front and side collisions as well as rollover performance? With the Mustang putting up stats like this, Ford is able to push ahead of the pack with the leading number of five-star rated vehicles in the fleet. The 2010 Ford Mustang coupe has earned the U.S. government's top 5-star safety ratings, which includes 5-stars for driver and passenger in front and side crash tests, as well as for rollover performance. DETAILS: The new Mustang uses high strength steel in its body structure and uses ultra high strength steel in the door intrusion beams for additional side impact protection. Sales Leader Mustang remains the number one selling sports car by a wide margin, with the new 2010 model driving showroom traffic. In April, Mustang had nearly a 40 percent share of the retail sports car segment. 06-02-09: Ford released its May sales numbers today which show one of the best months since July of last year against the news of GM entering bankruptcy and Chrysler finishing up with theirs. For the seventh straight month, Ford saw a market share increase as exciting new products continue to break sales records and bring new customers for the Ford lots. 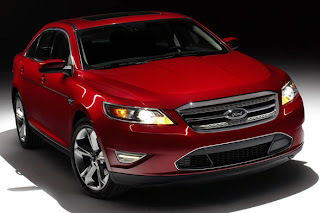 Models like the new 2010 Ford Fusion lead the sales charts with a 9% increase over last year. Lincoln is even up 2%. Overall Ford saw a 20% increase in sales over last month, giving the brand a cautious optimism that there might be a bottom in the declines over the past year. Though Ford executives cautioned that the next 90 days would be a volatile time due to the bankruptcy of GM and Chrysler as well as the fire sales of their many closing dealerships, they believe Ford will continue to capture a larger portion of the market through the end of the year. Consumers worried about buying cars from GM and Chrysler are headed to Ford dealerships in increasing numbers. Ford was the only one of the Big 3 who did not ask the government for a bail out, and that has given them major points in consumer sentiment which is largely against the federal bailouts. When you factor in the major new products coming from Ford this summer including the new 2010 Ford Taurus, Ford Transit Connect, and Lincoln MKT the outlook continues to look good for the blue oval. While the economy is challenging, Ford is finding that buyers are opting for more fully loaded cars right now, and passing over the strippers. With Ford is rolling out new 345hp twin-turbo Eco-Boost options in a number of new cars this summer, that will only add to their appeal. The 2010 Mustang is off to a good start in sales in May with 8812 units. Though the numbers are still slightly down from a year ago.The best part of Ford’s sales trend right now is that they have been able to move more metal with lower incentives than in the past. With far less unsold inventory on hand, they are not forced to give the cars away which means they are making more profit on each car sold. With all this news, Ford has planned an increase in production for the 3rd quarter of 10,000 cars and trucks, further cementing their path of recovery and giving Ford employees a better feeling about their jobs in the short term. For you consumers, Ford is rolling out a new promotion starting today where they will make your first three payments to get you through the summer. This new promotion will help get people into a new car, allowing them to skip payments until this fall. Check out the “Drive the Ford Difference” program.